A custom logo mat at any entrance or exit to your building will help improve brand recognition. 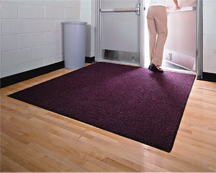 Walk off mats are a great dust control tool that can stop 80% of soil entering your building right at the door. Custom logo mats are a great dust control tool and branding tool for your business. Here are a few ways custom logo mats can act as a strong branding tool for your business. The right walk off mat will be large enough to catch all the foot traffic, and people have to take notice of it when they enter your office or store. A well designed logo and color scheme will be eye catching and help set the tone for anyone coming inside. The hope is that the walk off mat gives a strong first impression as to what kind of company the person is dealing with. Worried about heavy soil mucking up your logo? An outdoor scraper mat is the best way to encourage your clients and customers to clean off before coming in. What’s better than a custom logo mat at your front door? Having one at all of the entrances to your business. Not only will this make the most of walk off mats’ ability to control dust, but it will make it impossible to ignore your company’s logo. This entry was posted on Friday, December 9th, 2016	at 2:16 pm	. You can follow any responses to this entry through the RSS 2.0	feed. Both comments and pings are currently closed.